Vinedusk Village is a small town in western Reaper's March, east of the Malabal Tor gate. It houses the Vinedusk Rangers headquarters, where most of its members and their families live. 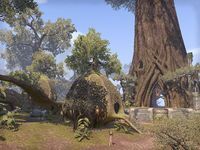 Although entirely constructed in Bosmer-style and having a graht-oak as its central building, the town have been built upon a more ancient Ayleid settlement. Also, there are underground Ayleid tunnels below the very graht-oak, constructed in a similar way as those found in Elden Root, but in a smaller scale. The town is a military settlement and has not Treethane nor any other formal government beyond the role played by the Vinedusk Rangers higher ranks. This organization is famed for not respecting the Green Pact so strictly as other Bosmer do and that is reflected in the pragmatical way of life of the town. Vinedusk Village Objective: Help the Vinedusk Rangers fight off the Colovian invaders. 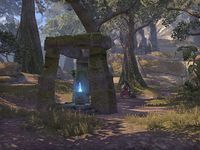 Vinedusk Wayshrine is located outside town, just off the road from the Malabal Tor gate. This wayshrine is unlocked as soon as you enter Reaper's March, and its Discovery XP is added to your next Discovery increase. 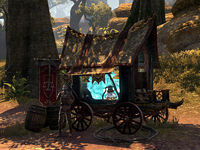 The Crystal Corner guild kiosk, owned by Ambarys Teran, can be found beside the Wayshrine.